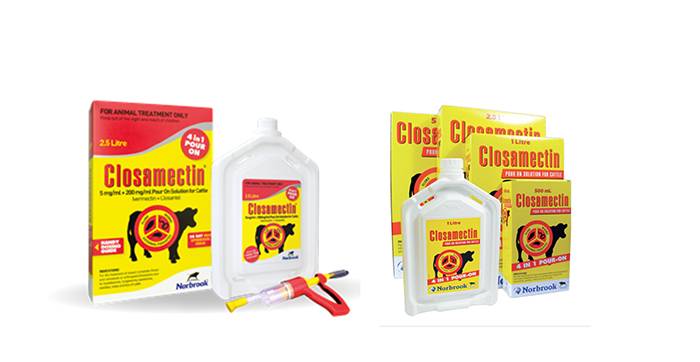 Norbrook Laboratories has announced an extension to the withdrawal period for its combination ivermectin and closantel endectocide Closamectin (5mg/ml + 200mg/ml) Pour-on Solution for Cattle. The product is now subject to a withdrawal period of 58 days for meat and offal; previously 28 days. The change has been approved by the Veterinary Medicines Directorate (VMD) and an updated summary of product characteristics (SPC) will be available on the VMD website. The change in withdrawal period takes effect immediately and customers are being offered practical support to inform their end users. Mark Collinson, Norbrook’s general manager, said: “Our aim is to maintain the highest standards of pharmaceutical safety and efficacy, which includes regular reviews of our products. Mr Collinson said this change will meet the food producing industry’s requirement to reduce the amount of residues going into food and the environment thereby helping producers maintain the highest possible standards of food safety. Mr Collinson said that SQPs and farmers should follow the amended withdrawal periods and apply them forthwith (even where the product labelling indicates otherwise).